The Lokniti-CSDS pre-poll data indicate that failure to negotiate a broader alliance with smaller parties, the Congress’s weakness as an ally, and uncertainty regarding party leadership played a role in the DMK coming up short. Forty-six per cent of the voters in Tamil Nadu said the AIADMK government did not deserve another chance, while more than 37% said it did. Why, then, did the AIADMK’s principal opponent, the DMK, fail to capitalise on this sentiment? The Lokniti-CSDS pre-poll data indicate that failure to negotiate a broader alliance with smaller parties, the Congress’s weakness as an ally, and uncertainty regarding party leadership played a role in the DMK coming up short. The DMK-led alliance won 40% of the votes, just short of the AIADMK’s 41%. 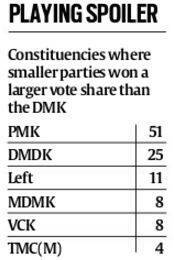 An analysis of the Election Commission returns indicates that a DMK alliance with any of several other small parties might have made up the vote margin in many Assembly constituencies, giving the party a win. The see-saw nature of Tamil Nadu politics over the last three decades obscures the role of small, often caste-based, parties at its fulcrum whose allegiance can shift power from one Dravidian party to another. For both Dravidian parties, the path to victory is generally built upon multi-party alliances. In 2001, an alliance with the TMC(M), Congress, PMK, CPM and CPI was crucial in producing an AIADMK win. Similarly, the DMK could not have returned to government in 2006 without its alliance with the Congress, PMK, CPM and CPI. For the recent Assembly elections, the DMK constructed an alliance with the Congress, PT, IUML and MAMAK. But it was not broad enough. The People’s Welfare Front (PWF), the DMDK-led alliance quixotically hoping to break the bipolar logic of Tamil politics, only ended up taking anti-AIADMK vote from the DMK. Overall, the DMK-led alliance won less than half (49%) of the voters who thought the AIADMK government did not deserve another chance, with the remainder split between the PWF (12%), PMK (8%), BJP (4%) and other parties (10%). The DMK-led alliance won 98 seats in the legislative Assembly to the AIADMK’s 134. Therefore, if the DMK-led alliance had changed the outcome in 19 constituencies, they would have secured a majority of seats. An alliance with the PMK, which won a larger vote share than the DMK’s losing margin in 51 constituencies, might have produced such an outcome, as would have an alliance with the DMDK. Allying with small caste-based parties is complicated, since inter-caste rivalries can hurt vote share among some castes even as it transfers the votes of others. An alliance with PMK would likely have cost the DMK some Dalit votes, just as an alliance with the VCK would likely have cost it Vanniyar votes. Thus, it is not possible to definitively conclude that any particular alliance would have delivered a DMK win. However, there is little doubt that the DMK would have benefited from a broader alliance. Congress proved to be a weak partner for the DMK as it did not transfer many votes to its Dravidian ally (see box). While 85% of voters who traditionally support DMK backed the DMK-Congress alliance, only 52% of traditional Congress supporters voted for the alliance. Astoundingly, 52% of those who voted for the Congress in 2014 opted for the AIADMK in these elections, while only 28% backed the DMK-Congress alliance. Had the Congress transferred more votes to the DMK alliance instead of AIADMK, the final result could well have been a DMK victory. In constituencies where the DMK contested, it won 41% of the votes, more than the AIADMK’s average of 40.77%. But the Congress won only 36.63% of the votes in the constituencies it contested. Therefore, the DMK-led alliance would likely have won more seats overall had fewer seats been allotted to the Congress. The narrow final vote margin raises questions about how the DMK would have performed if M Karunanidhi’s son, M K Stalin, had clearly been projected as chief minister. According to the pre-poll data, 19% of the voters preferred Karunanidhi as the next chief minister while 10% preferred Stalin. Surprisingly, of those who preferred Stalin, 51% voted for AIADMK while 47% voted for the DMK-led alliance. The reason may be Karunanidhi’s age. Stalin supporters who voted for AIADMK were more likely to say Karunanidhi is too old to be chief minister than those who voted for DMK. 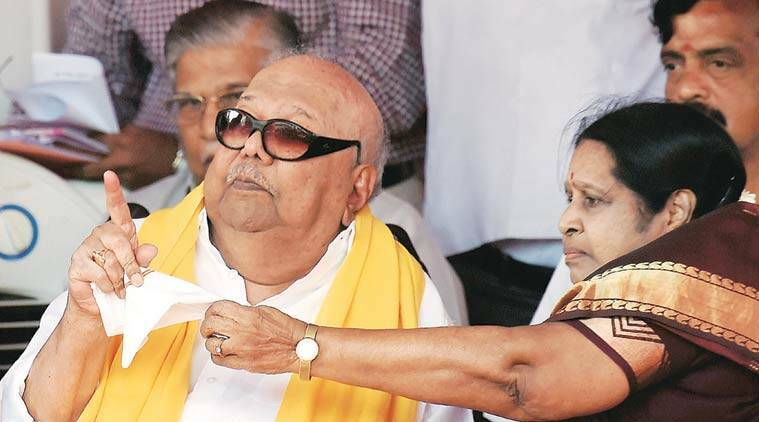 This suggests that Karunanidhi’s continued leadership may be limiting the DMK’s appeal, and that the DMK-led alliance might have won had Stalin been clearly projected as the chief ministerial candidate. While the DMK improved upon its dismal 2011 performance, its inability to swing the pendulum of Dravidian politics back to its corner should prompt some soul-searching. The party will likely need a broader multi-party alliance and may need new leadership to mount a challenge to J Jayalalithaa in future contests.